Amateur astronomer Zack Payne took these photos of the supermoon during his "moon party" in Knoxville, Tennessee, on Nov. 14. Amateur astronomer and space enthusiast Zack Payne wants more people to get excited about looking at the sky. 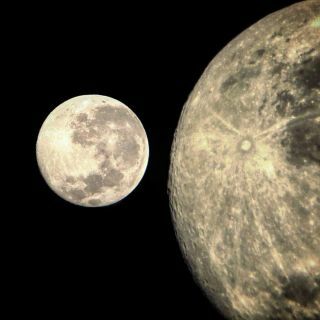 So when November's full "supermoon" came the closest to Earth that it's been since 1948, he threw a "moon party" for his peers to come together and check out the giant, glowing moon in all its glory through his brand-new telescope. Payne, who happens to be an old friend of mine, threw his supermoon viewing party on Nov. 14 in my hometown of Knoxville, Tennessee. Originally, his plan was to take his brand-new Orion SkyQuest XT10g Dobsonian Telescope out for its first test run and to spend the evening moon gazing with a few of his fellow space fans. To his surprise, a crowd of about 50 people showed up to see the supermoon. "I figured only like 10 or 15 would show up," Payne said. By the time Payne had lugged the 70-lb. (30 kilograms) telescope to Victor Ashe Park, he was over the excitement of seeing his huge new telescope. Instead, he was stoked to see how "super" the moon looked in his stargazing machine. Compared to when he used his older XT8 Dobsonian telescope, the view was incredible, Payne said. "Everything is crisper, and it's a lot more detailed," he said. "The moon was indeed super," partygoer Aaron Howell, who had never looked through a telescope before, told Space.com in an email. "The vast craters and scarred face were far beyond detailed … It gave great perspective to the test of time upon such an immense object." Amateur astronomer Zack Payne took this photo of the supermoon during his "moon party" in Knoxville, Tennessee, on Nov. 14. Despite the light pollution and air pollution over Knoxville, Payne's telescope images turned out clean and crisp. With wildfires rampant in the southeastern U.S., a smoky haze had been lingering over the city for days. "With the haze, the light pollution formed a huge curve in the sky," Payne said. To take the best photos of the moon, he had to wait for it to rise high enough in the sky to where the atmosphere didn't interfere so much with the view. He arrived at the park to set up his telescope around 6:30 p.m. EST (2330 GMT), but he took his best supermoon photos closer to midnight, when most of the partygoers had already left. The supermoon party was actually cut short by a park ranger, who insisted that they take their skywatching festivities elsewhere. The crowd quickly dispersed, leaving Payne to defend his own sluggish exit to the park ranger. "I have a telescope, man — hold on!" he hollered at the impatient ranger. Payne's supermoon party was such an unexpected success that he now plans to throw more skywatching parties like it in the future. But he plans to shoot for more than just the moon: His next big plan is to throw a planet party, followed by galaxy parties, nebula parties, etc. If it's in his telescope's catalog, he's going to turn it into a reason to party. For Payne, the best thing about his new telescope is its ability to bring his peers together to observe and appreciate space. "People were superexcited. They loved it. People even brought chairs to sit on and hang out. I got to teach them all about space," he said. Now that it's clear that Payne's peers are interested in stargazing with him, he hopes to start an amateur stargazing class — free of charge — for the Knoxville community. "I don't have any formal astronomy education, but I do have the drive to want to inspire people," Payne said. And what better way to inspire young people than to party in the name of space.